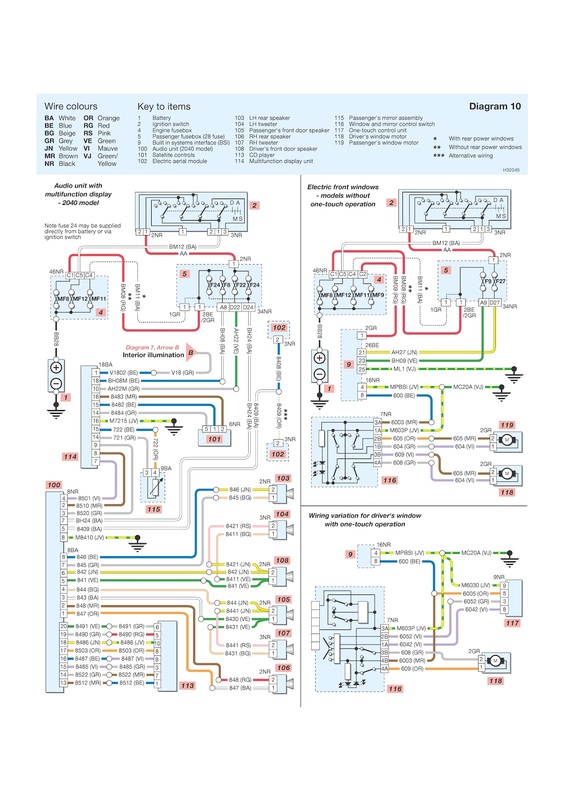 I've got emails requesting the Peugeot 206 wiring diagrams. Most them had got clear info from the previous posts and want for more. 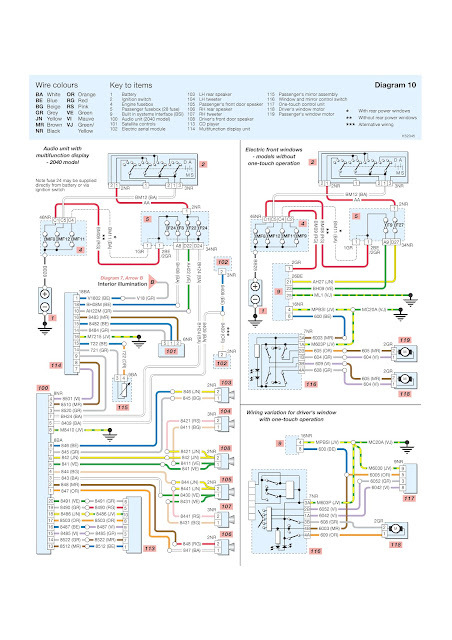 So, I would like to provide more and more schematic wiring diagrams as the feedback of the appreciation to those who get a lot of information in this Blog. Key to items: 1 Battery, 2 Ignition switch, 4 Engine fusebox, 5 Passenger fusebox (28 fuse), 9 Built in systems interface (BSI), 100 Audio unit (2040 model), 101 Satellite controls, 102 Electric aerial module, 103 LH rear speaker, 104 LH tweeter, 105 Passenger's front door speaker, 106 RH rear speaker, 107 RH tweeter, 108 Driver's front door speaker, 113 CD player, 114 Multifunction display unit, 115 Passenger's mirror assembly, 116 Window and mirror control switch, 117 One-touch control unit, 118 Driver's window motor, 119 Passenger's window motor. You also need to consider the wire color codes, and here is the list of wire colors codes: BA White, BE Blue, BG Beige, GR Grey, JN Yellow, MR Brown, NR Black, OR Orange, RG Red, RS Pink, VE Green, VI Mauve, VJ Green/yellow. Well after you understand the codes above you will be able to solve your wiring problem. Be sure that you make no mistakes, failures, and errors. The clear, readable and colorful schematic wiring diagrams will be shown below. Just click on image to enlarge. If you still not sure with your work, it is better for you to have an Insurance for your car. If you wanna buy new car but you can't afford it, Bank Loan may be the best coice. if you already have the new one it is good for you to do Charity by Donate Car for social purposes.